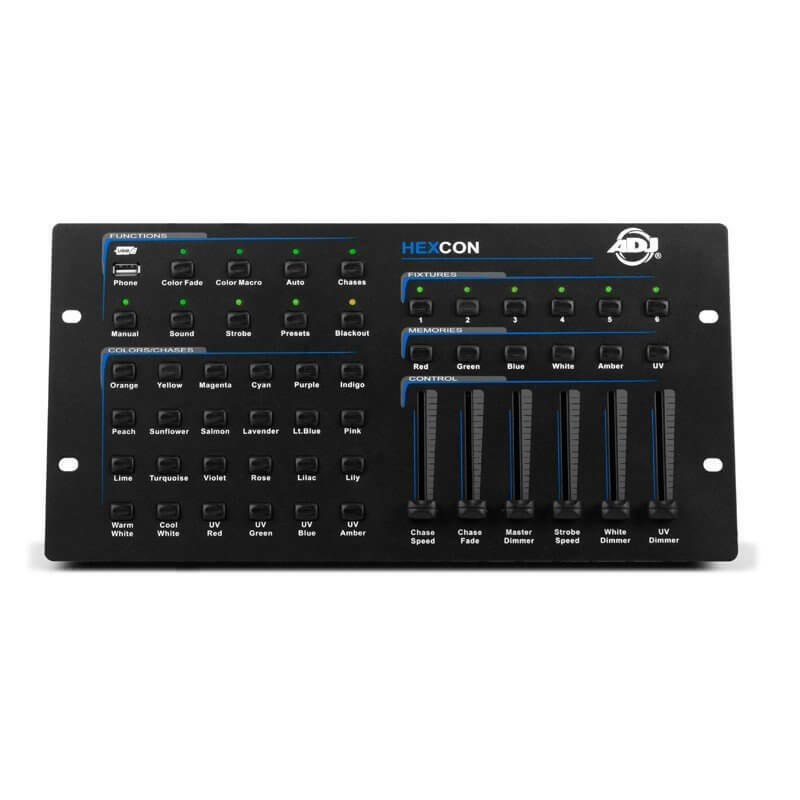 The HEXCON is a 36-channel DMX controller that was specifically designed for our âHEX Series" products. Up to 6, RGBAW+UV, LED fixtures or fixture groups can independently be controlled via six fixture buttons. 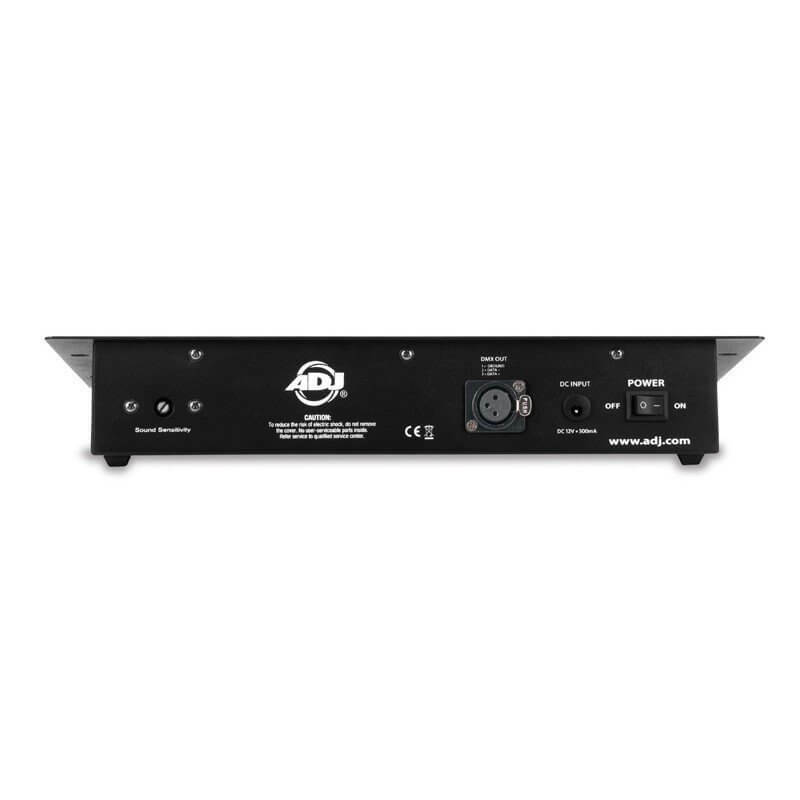 All ADJ HEX series fixtures or fixture groups must be set to run in DMX mode and be addressed at channels 1, 7, 13, 19, 25 and 31 to access independent fixture control. The HEXCON control panel includes 24 direct access pre-programmed color macro buttons, 6 user programmable color preset buttons which come factory set to control Red, Green, Blue White, Amber and UV, 6 multi-function channel faders which are used to control individual color intensity, Chase program âSpeed", Chase program âFade", Master Dimmer and Strobe speed. There is an array of 8 âFunction" buttons which are used to select the controllers operation mode, including Color Fade, Color Macro, Auto, Chases, Manual, Sound, Strobe, Presets and Blackout modes. A USB port is also conveniently included so most phones or tablets can be connected and charged. The HEXCON is one of the simplest and most versatile LED controllers available today. It's ideal for D.J. 's, nightclubs, lounges, bars or for anyone that wants to get the most out of their HEX series LED products.